WHAT: After he’s fired from his gig co-anchoring the national news with his wife Veronica (Christina Applegate), Ron Burgundy (Will Ferrell) is given a chance to become part of the first-ever 24-hour news channel. But when Ron butts heads with star anchorman Jack Lime (James Marsden) upon his arrival, he makes a bet with him that he’ll get bigger ratings, despite the fact that his news team has been saddled with the graveyard shift. WHY: For years, Will Ferrell has resisted the urge to make a sequel to any of his films, but if there’s one character from his repertoire deserving of a second helping, it’s Ron Burgundy. Unfortunately, while “Anchorman 2: The Legend Continues” aims to match the original’s absurdist tone, it just doesn’t compare. The movie is at times funnier than its predecessor, but it’s also wildly inconsistent, bouncing aimlessly between gut-busting hilarity and entire sequences that miss their mark. Part of the reason is the movie’s nearly two-hour runtime, which is plagued by several long stretches where nothing funny happens, including a bizarre third act twist that comes across as being ridiculous purely for the sake of it. Even more troubling is how poorly the supporting cast is utilized this time around. While Ferrell is excellent once again as the mustachioed anchorman, Paul Rudd and David Koechner are pushed to the sidelines for much of the film, while Steve Carell’s simple-minded weatherman is given a romantic subplot with Kristen Wiig’s similarly awkward secretary that isn’t as funny as intended. Still, while it’s not as quotable as the first movie, “Anchorman 2” has more than enough laughs that it’s an enjoyable, albeit uneven and incredibly gonzo, comedy. EXTRAS: Paramount really went above and beyond with this Blu-ray release, which includes three different versions of the film: the original theatrical cut, an unrated cut and a super-sized R-rated cut that runs a whopping 143 minutes and contains 763 new jokes, among other new material. Additionally, there’s an audio commentary with director Adam McKay and the cast, a making-of featurette, four more production featurettes, a lengthy gag reel, deleted, extended and alternate scenes, clips from the table read, and if you can believe it, much more. WHAT: Following the death of their master, 47 leaderless samurai vow to seek revenge on the treacherous warlord (Tadanobu Asano) and evil witch (Rinko Kikuchi) responsible with the help of an enslaved half-breed (Keanu Reeves) who was raised by demons. 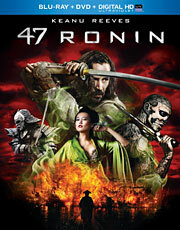 WHY: For a director packing as much style as Carl Rinsch, it seemed only natural that “47 Ronin” would at least be pretty to look at, even if it lacked the necessary substance to be any good. But unfortunately, Rinsch’s feature film debut fails in both departments, resulting in a disappointingly dull samurai flick that ranks among one of the most forgettable big-budget movies of last year. You’d think that co-writers Chris Morgan (the “Fast & Furious” franchise) and Hossein Amini (“Drive”) could squeeze a little fun out of the premise, but it’s an incredibly somber affair that takes things far too seriously considering the fantasy elements involved in the story. Though Rinsch deserves some credit for convincing a major studio to green light a Keanu Reeves vehicle with Japanese screen veteran Hiroyuki Sanada, and not Reeves, playing the main lead, the actor’s presence ultimately proves to be more of a distraction than an advantage. History buffs will appreciate the story of the 47 ronin getting the Hollywood treatment, but instead of wasting time on this movie, do yourself a favor and check out Rinsch’s commercial and short film work instead. EXTRAS: The Blu-ray includes a brief making-of featurette, a pair of additional featurettes on the fight choreography and visual FX, and some deleted scenes. WHAT: After getting dumped by his longtime girlfriend, aspiring musician Joe (Ryan Kwanten) is persuaded by his two best friends (Steve Zahn and Peter Dinklage) to join them at their weekend live-action role-playing event. But when they accidentally conjure up a demon from Hell, the players must band together to stop it. 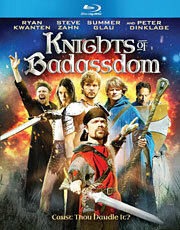 WHY: When “Knights of Badassdom” was first announced a few years ago, it sounded like it could be a fun little movie, especially with the talent involved. Ryan Kwanten was starring on one of the hottest shows on television (“True Blood”), Peter Dinklage had just won an Emmy for his outstanding work on “Game of Thrones,” and Summer Glau already had plenty of geek cred to her name between “Firefly” and “The Sarah Connor Chronicles.” But as the years passed, so did any hope that the film would ever see the light of day, mainly due to some messy behind-the-scenes drama between director Joe Lynch and the original financiers. And it’s easy to see why, because “Knights of Badassdom” is downright terrible – a clunky, half-baked horror-comedy that doesn’t even come close to fulfilling its potential. There are very few laughs throughout the movie’s brisk 86-minute runtime, and the visual effects look unfinished in most cases, particularly the main creature, which is just a man in a really shoddy rubber suit. It’s hard to imagine how stoned someone would need to be to enjoy “Knights of Badassdom,” because with the exception of some amusing performances by Dinklage and Jimmi Simpson, it’s a pretty joyless experience. EXTRAS: There’s a behind-the-scenes featurette, interviews with Steve Zahn, Peter Dinklage and Summer Glau, and footage from the San Diego Comic-Con panel.